We’d love your help. 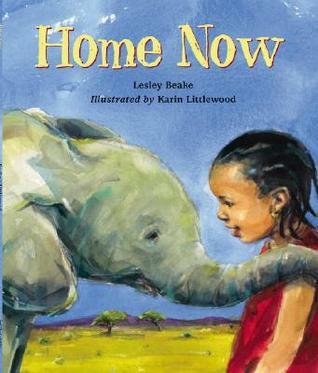 Let us know what’s wrong with this preview of Home Now by Lesley Beake. Sieta remembers a happy home far away over the mountains, but now she is living with her Aunty in a place she calls Home Now. Her new home is a busy, friendly place, but Sieta can't seeem to smile. Then one day she meets an orphaned baby elephant at the elephant park, and she begins to see things in a different light. To ask other readers questions about Home Now, please sign up. Beake’s intended purpose for Home Now is to gain awareness of the AIDS epidemic in Africa. She tells this story through Sieta’s eyes; a little girl who lost her parents to the AIDS epidemic, and now resides in a place she refers to as “Home Now”. 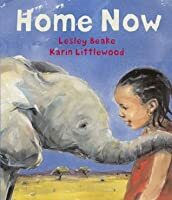 She befriends and develops a connection with an orphan elephant, whose story and friendship helps her through the adjustment to her new life and her “home now”. This heartfelt story gives the reader a window view of the life of an orphan child, the struggles of adjustment, as well as the severity of the AIDS epidemic in Africa. In the story Beake does not come out and blatantly state what Sieta’s parents died from, but at the end in “A Note About the Story” she states that although the story of Sieta is fictional, many children are orphaned due to their parents dying from AIDS. Without the endnote, the students would not know why the parents died. But for students who aren’t prepared or aren’t emotionally ready to grasp the fatality of AIDS, this story would still play an impacting role on them. England’s Karin Littlewood’s, illustrations are what draws the reader’s attention to the African culture. Her use of watercolor, gouache, and textured papers show us glimpes of Africa, Sieta, and her new home and friendship. The watercolors create a dream-like feel to the story, which represents Sieta’s feelings. The double page spread and large proportions that Littlewood uses, show the significance and impact of the elephant and Sieta’s relationship. Home Now is a great means for discussion with students, and evokes many emotions. Yes, this is most likely a window story for most of my students, but hopefully they will see a mirror reflection within the window. Mostly everyone has moments when they are alone, lonely, or aching for home. This helps put our loneliness into perspective, and hopefully like Sieta see the light at the end of the tunnel and seize the moments you have. Home Now is a post-apartheid South African picture book about a little girl named Sieta who has become an orphan after losing both of her parents to illness. She now lives with her Aunty in a place everyone calls “home now” and can’t help but to feel sad when she remembers her old home over the mountains. One day, when Sieta’s class visits an elephant park, she finally finds comfort through companionship with the smallest orphan elephant, Satara. What a sweet and gentle story! This book is sure t Home Now is a post-apartheid South African picture book about a little girl named Sieta who has become an orphan after losing both of her parents to illness. She now lives with her Aunty in a place everyone calls “home now” and can’t help but to feel sad when she remembers her old home over the mountains. One day, when Sieta’s class visits an elephant park, she finally finds comfort through companionship with the smallest orphan elephant, Satara. What a sweet and gentle story! This book is sure to capture the heart of its readers, young and old alike, and is most appropriate for children ages 4-8. It deals with themes such as everyday life, loss, and companionship. Having been someone who has lost a parent to illness, I couldn’t help but connect with Sieta as she remembered past memories of her Ma and Pa that brought her great sadness. The whispy, watercolor illustrations are absolutely gorgeous and really add to the overall emotion of the story. As a teacher, I would use this book as a class read aloud to have students think deeply about Sieta’s character, discuss her feelings/actions, and chart how she changed throughout the story. I would also include this book in a cultural unit on South Africa and have students learn about some of the different areas of land in South Africa and the different types of animals that are native there. Students could then compare South Africa’s land and native animals to that of Texas. After a little girl looses both of her parents she must find a new home with her Aunt in a much busier town than she is used to. One thing she does find is a friendship with an orphan elephant at the elephant park. This loving relationship helps the little girl cope with the traumatic loss of her parents. This picture book is a moving story of loss and how one can cope with it. This being said, young readers may question just how the girl’s parents die. This is not specifically identified throug After a little girl looses both of her parents she must find a new home with her Aunt in a much busier town than she is used to. One thing she does find is a friendship with an orphan elephant at the elephant park. This loving relationship helps the little girl cope with the traumatic loss of her parents. This picture book is a moving story of loss and how one can cope with it. This being said, young readers may question just how the girl’s parents die. This is not specifically identified through the text of the book. To the adult reader it is apparent the parents die of AIDS. I would recommend this book be used with children that may need it and that it not be available to all children on the shelves of the school library. The water color illustrations are fantastic and depict Africa in a positive light. While the scenery is appealing and make this reader want to visit Africa they are also able to depict the varying emotions throughout this book. This book about a little girl who has been sent to live with her aunt because both of her parents died of AIDS. She is sad and misses her home and parents. Her class takes a fieldtrip to a nature reserve and she becomes intised by a baby elephant whose family has gone off to hunt and is left alone. The next day the little girl goes back to the reserve and hangs out with the elephant again and realizes that she isn't alone, she has her aunt. When she goes home her aunt has planted the same plants This book about a little girl who has been sent to live with her aunt because both of her parents died of AIDS. She is sad and misses her home and parents. Her class takes a fieldtrip to a nature reserve and she becomes intised by a baby elephant whose family has gone off to hunt and is left alone. The next day the little girl goes back to the reserve and hangs out with the elephant again and realizes that she isn't alone, she has her aunt. When she goes home her aunt has planted the same plants her mother had planted at home to make her feel more at home. WAY depressing for children. I think it presents important themes to talk about with children, but there was a lot of big hurt feelings and not a lot of resolution or talk about what to do with those big hurt feelings, Two stars seems so negative, but it means "it was OK" and it was. I edited a lot and had to do a LOT of damage control after. The book didn't fend for itself, so if you have kids who've lost family or can relate at all to fear, death, sickness, etc, this is a trigger book that mig WAY depressing for children. I think it presents important themes to talk about with children, but there was a lot of big hurt feelings and not a lot of resolution or talk about what to do with those big hurt feelings, Two stars seems so negative, but it means "it was OK" and it was. I edited a lot and had to do a LOT of damage control after. The book didn't fend for itself, so if you have kids who've lost family or can relate at all to fear, death, sickness, etc, this is a trigger book that might require a lot of work after. Poor little Sieta is taken away from her mom and dad after they passed away, and she now lives with her Aunty at Home Now. Sieta remembers and misses times with her parents and is very sad. One day, Sieta meets an orphaned baby elephant, Satara, and finds a friend in the small elephant. Sieta learns to be happy thanks to the elephant and decides to make friends with the children at Home Now. The illustrations in this book are absolutely beautiful. -The note at the end of the book speaks of AIDS Poor little Sieta is taken away from her mom and dad after they passed away, and she now lives with her Aunty at Home Now. Sieta remembers and misses times with her parents and is very sad. One day, Sieta meets an orphaned baby elephant, Satara, and finds a friend in the small elephant. Sieta learns to be happy thanks to the elephant and decides to make friends with the children at Home Now. The illustrations in this book are absolutely beautiful. This book is about Sieta, a young girl who is dealing with the loss of both parents due to AIDS. Sieta has to cope with trying to find her place in a new home. I would use this book in my classroom to talk about loss and even in a compare and contrast unit to discuss diseases that plague other countries worse than they do in the U.S. and why. A girl's parents die (from AIDS) and she goes to live in her new "home now" with her aunt. While there she befriends an orphaned elephant and slowly adjusts to her new life. Multiculural. Fantastic illustrations. Good story. This story was about an orphan child who became close to an elephant when she found out that the elephant was an orphan too. This would be a good story to read to talk about the different types of families we may have in the classroom. This story tells about a young girl whose parents die. She then goes to live with her aunt in an African village. She learns many new things and meets some great friends. This story is a nice example to help children cope with death. It focuses on the transition of the main character. The main character is taken away from her home once her parents die of AIDS. She now has to live with her aunt. While living with her aunt she connects with a baby elephant. This book was very sad but would be an excellent book to read when talking about diseases. An AIDS orphan adapts to her new home with her aunt after meeting a small elephant at the animal orphanage. Lovely, realistic watercolors. Beautiful pictures and soft story about a grieving girl's relation to an elephant calf. Set in South Africa-- story about a girl who loses her parents to AIDS and is very sad but starts to feel better when she meets an orphaned elephant at a refuge. This is a great story about a young girl losing her parents and then becoming friends with an elephant. Lesley Beake has been involved with writing and editing children’s stories for twenty years now and has published nearly seventy books. All her stories are set in Africa and are rich in African imagery and landscape. They vary from picture books for the very young, to novels for teenagers, with a good spread of stories for all ages in between. Much of her work involves writing for readers who are r Lesley Beake has been involved with writing and editing children’s stories for twenty years now and has published nearly seventy books. All her stories are set in Africa and are rich in African imagery and landscape. They vary from picture books for the very young, to novels for teenagers, with a good spread of stories for all ages in between. Much of her work involves writing for readers who are reading in English as their second, third, or even fourth language. The challenge of corresponding a reading level with an interest level is helped by her background in primary school teaching and in teaching English as a Foreign Language in the Middle East for the British Council. Lesley also has a wide portfolio of travel writing, radio broadcasting and website work. She was editor of two major South African travel publications and of the Air Malawi in-flight magazine and currently manages and edits a website for San communities at www.kalaharipeoples.net.